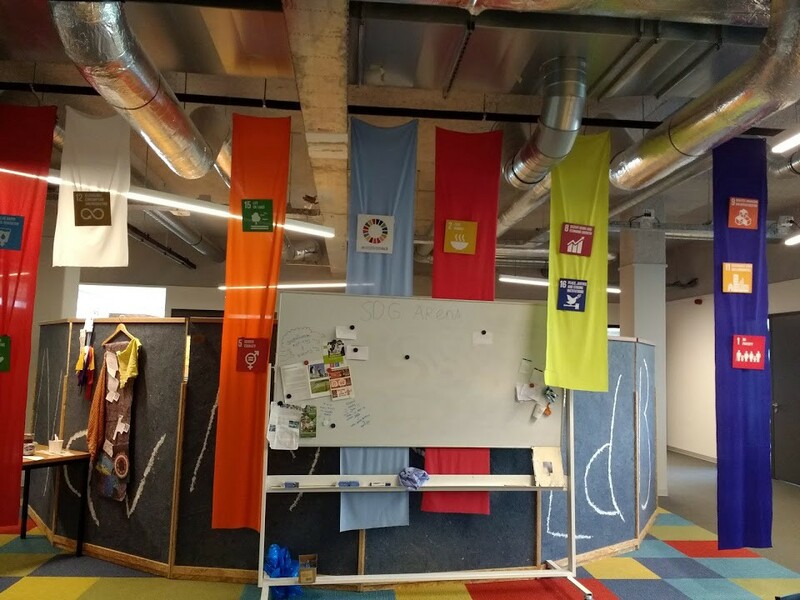 As a ‘Smart Solution’ semester team of students in the Netherlands, at the Saxion University of Applied Sciences, we joined the Global Goal Jam to “Impact our study”. 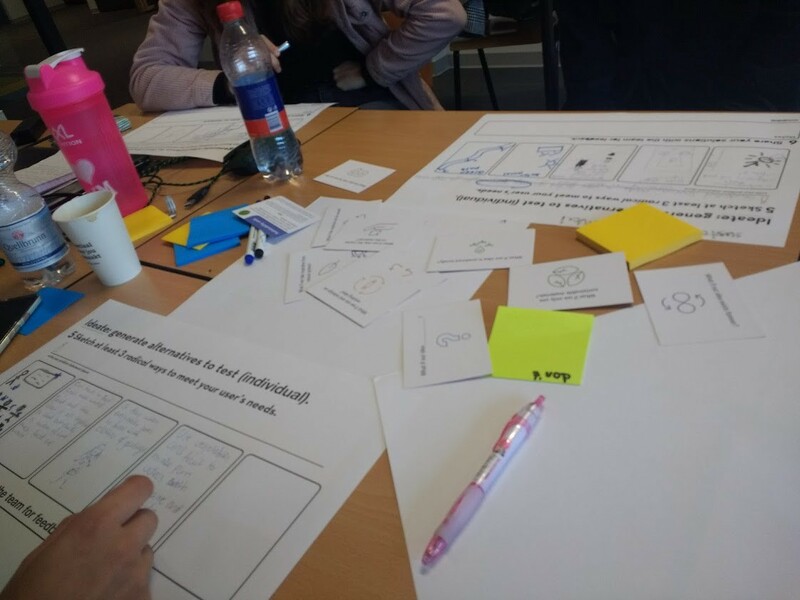 Saturday, the 22nd September 2018, three student groups and three student teachers came together to use our different study backgrounds to work with the Sustainable Development Goals of the United Nations as an University. With the beginning of the Jam a clear passion of the groups defined. The challenges the students wanted to work with conformed about the Sustainable Development Goal 12 — Responsible Consumption and Production. Within our technical study programs as Media, Information and Communication; Health & Technology; Fashion & Textile Technologies; Biology; and Creative Media and Game Technologies, the students reflected about challenges within their expertise and ideas learned from their education and for their future. The three groups worked at the same time but independently on the Sprint 1–4. 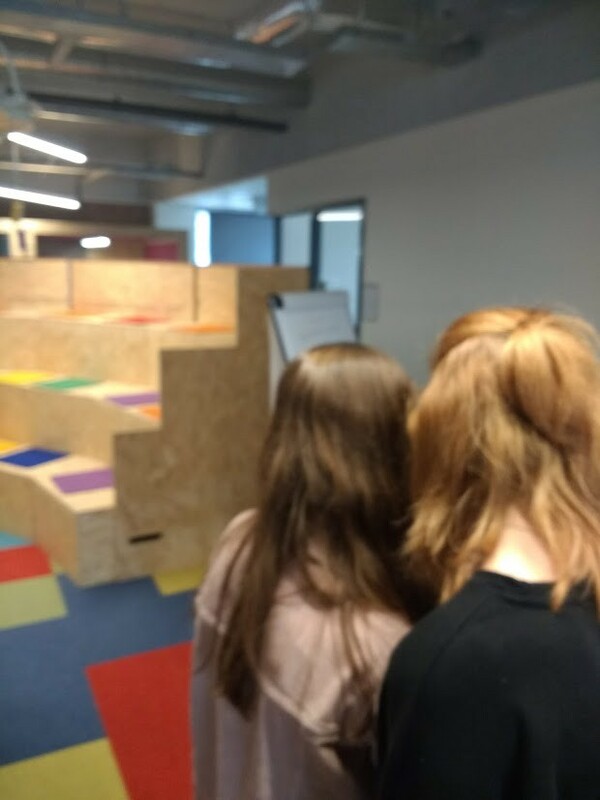 We came together in our ‘Sustainable Development Goals Arena’ to present and share our outcomes, and gave feedback and discussions about our entire group developments. 1. Observe, 2. Immerse, 3. Capture findings and 4. Define problem statement. ‘We want our students to activate our university management in responsible behavior’. For step 1 and 2 we used online research and the user story. We found out that our university already separates garbage. With the persona template from Xtension, we created the user story ‘Emma’, an environmental conscious student, who feels powerless to act responsible with the consumption and production related to her university. With a flipchart and 4 pencils, papers and laptops we tried to dive deep into the problem understanding of our target group. It was challenging under the so-called ‘cooker pressure’ (time limit) to find a target group as soon as possible. With a flipchart we brainstormed and finalized our presentation template. Then we presented our outcomes to the other 2 groups. ‘We want easy access to sustainable channels and tools for our university’. The craziest ideas we presented in our team arena. Sprint 3 was all about prototyping. We decided on our strongest idea of a ‘conscious concept store’. In the concept ideas of ‘rent a shelf’ , ‘pop-up store’ and ‘impact hub’ we wanted to give a room and display opportunity for sustainable tools and channels. All in regard of different university life aspects which could be involved with SDG 12 ‘Responsible Consumption and Production’. A role play revived our prototype idea. With the input of the other group prototype ideas we used the final template of the jam: ‘5. Ideate’. Individually, each group member ‘sketched at least 3 radical ways to meet our user’s needs’. We generated alternatives to test. Then we worked on our final pitch. 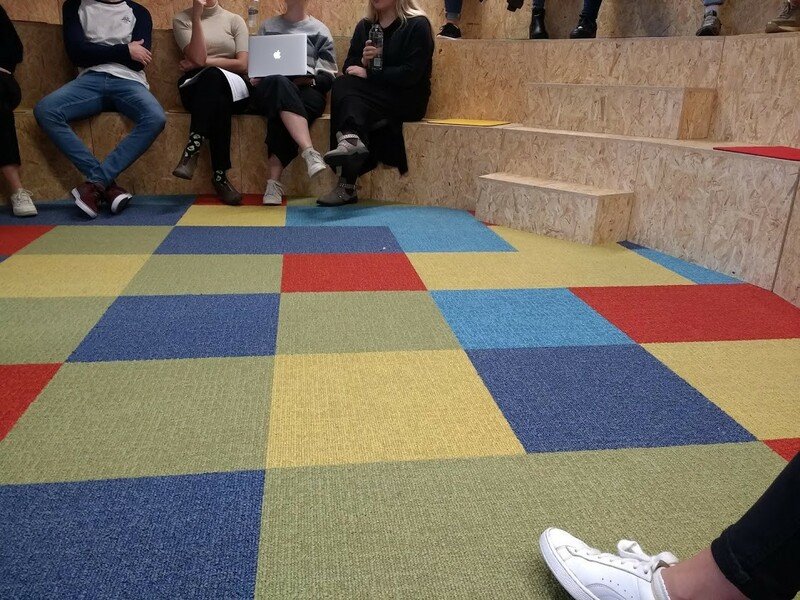 “How would you impact the behavior of students, to buy and involve with the sustainable products from your university concept store and not from other shops in the cities?” — Student, Fashion & Textile Technologies B.Sc. “How would you ensure that the sustainability tools and channels of your concept store will not overlap with other university societies being busy with similar approaches?” — Student, Media, Information and Communication B.Sc. With our last creative energy, we reflected again about the strongest arguments supporting our prototype idea and how they will solve our user’s needs. 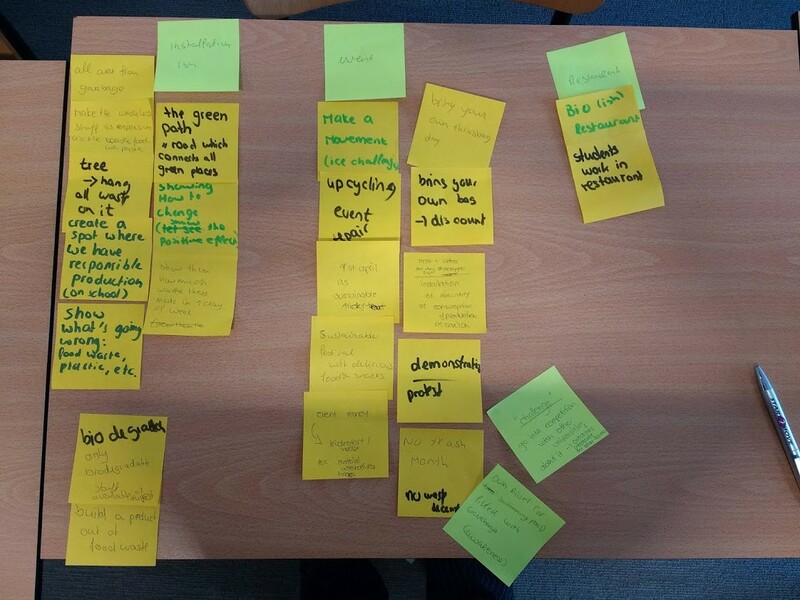 We decided to use our groups mission & vision of the prototype: ‘for students from students’ to pitch our final outcomes in an improvising and natural set-up. Our next step will be to reflect the Global Goal Jam outcomes as meaningful input for our semester project, which in a period of half a year will further get us into the Sustainable Development Goals and it’s ‘Smart Solutions’. To reflect the Jam as a whole, it was a challenging but a cheer-up day. It created a clearer framework for the ‘SDG semester’, which was the context in which the Global Goal Jam took place for us. The process & toolkits was a speed-up summary of what us, as the three student groups, will encounter us the next half year. As our head project aims to “come up with a concrete action plan for translating and implementing the SDG’s into concrete measures which support the stakeholders in making a positive impact” (Saxion, 2018). Creative processing is very individual per person, some students cherished the limitations of creativity and the tight agenda, other students had problems to evolve their creative ideas in such a set-up. The Global Goal Jam gave nevertheless the opportunity to get an insight in all three group’s ambitions and potential ideas how to work with the SDG’s in the upcoming weeks. Next time it would be nice to join the whole 3 days of the Jam and to also stream into the ‘global’ team atmosphere of ‘Design 2030 now’. Join, share, or raise awareness about our or your Sustainable Development Goals approaches. As students, and the generation of those who will make the next impact, we can encourage and help our projects to become more meaningful, smart and creative. Keep in touch or contact us about (collaborations, sources, feedback) our ‘Smart Solution’ semester on Instagram (in progress — check the comments). In February 2019 there will also be an accordingly ‘Smart Solution Festival’, which will take place at our Creative Technology Academy in Enschede, The Netherlands. Keep updated with our University website www.saxion.edu. Or check our Pitch video on Youtube to get a visual idea about our process on the Global Goal Jam 2018 (in progress — check the comments). A big thanks goes out to our inspirational and super ambitious and energetic teachers!